While shares could move higher, they're likely to take a break first. TheStreet's founder and Action Alerts PLUS Portfolio Manager Jim Cramer said investors should be careful with Shake Shack shares. 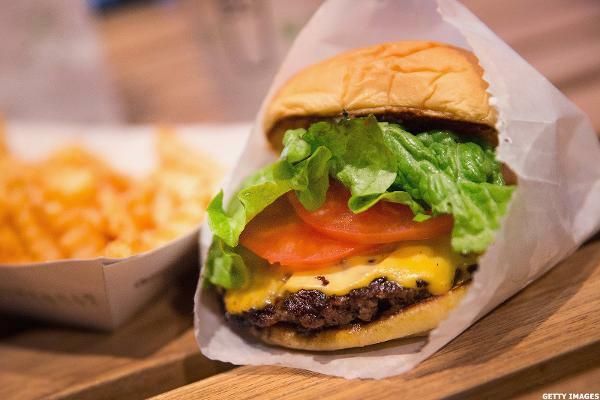 Shake Shack has formed a bearish technical pattern. Watch: What's on the Menu at Fatburger? As Fat Brands prepares to IPO, we took a look at the menu at its most famous chain, Fatburger. Considering that even the fries are 'fat,' the brand more than deserves its namesake. Is Jollibee About to Bite Off Sandwich Maker Pret A Manger in Record Deal? Jollibee, one of the best-known Filipino brands, is reportedly bidding north of $1 billion for British sandwich chain Pret A Manger, the biggest-ever deal out of the Philippines. Apart from big chains, very few restaurant companies have done well. It is not just tech names that attract insane traders during post-IPO action. The food is pricey, locations are scarce and the stock can't break out. Here's some inspirational leadership tips from Randy Garutti, Shake Shack's top executive.